Our first blog post, and a pretty great one to write. 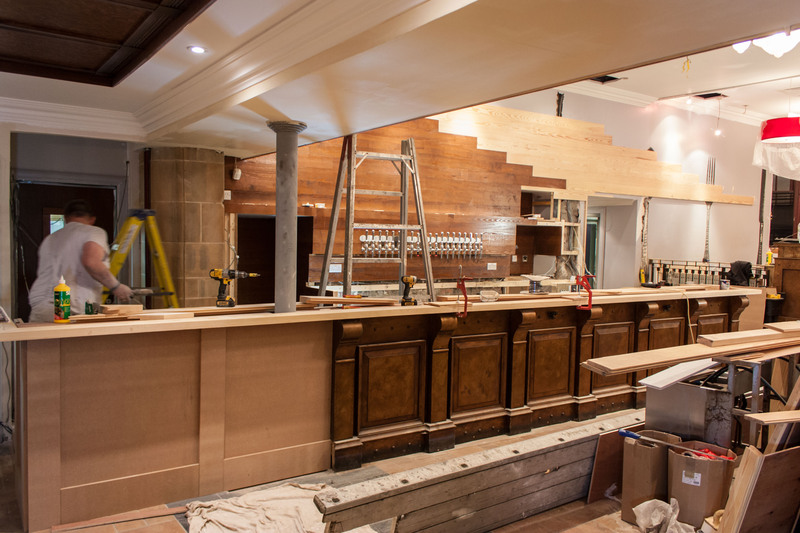 If you (lovely reader) have been in to the bar in the last couple of months since we opened, you’ll know that we’ve been preparing for a significant refurbishment for a while, with a comprehensive overhaul of the bar area. We’ve been dreaming, scheming and (sometimes) screaming for weeks now, waiting for the biggest part of the refurb to happen: the bar move. And finally, that day has come. Our plan was to strip away the facade, as it were, and let the building breathe a little by revealing more of the original character. We were lucky to come across two beautiful sandstone columns with lovingly carved details early on in the refurb. However, what we didn’t count on was the amount of fixing up that comes with surviving several fires and a few years of decrepitude! Much of the original stone and brick is now a patchwork of concrete and mortar. The challenge now is bringing together the elegance and craftsmanship of the Victorian builders with the industrial rough edges that come hand in hand with the railway. We’re excited to say, we think we’re well on our way to achieving that! The bar has now moved down from its pompous platform to a new, more egalitarian position on the back wall. And it is looking amazing. 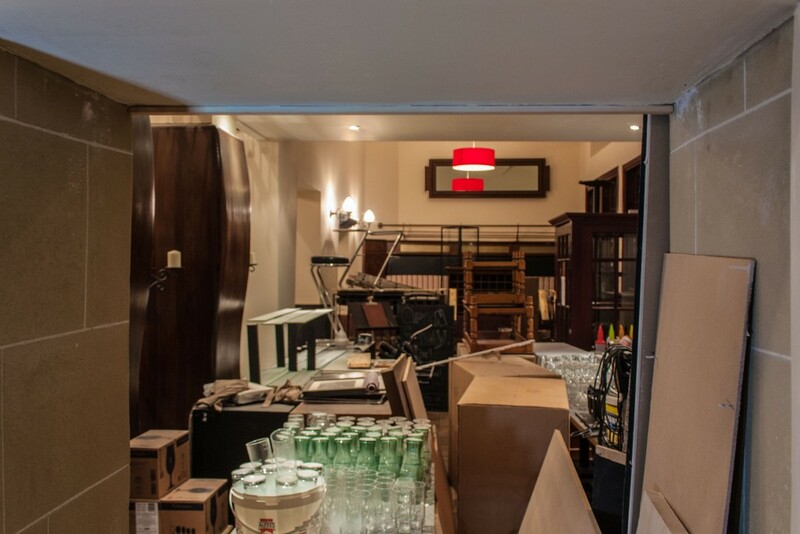 Our builders have worked tirelessly to try and get this mammoth move completed in our tight four day schedule; we’re still not sure whether we’ll make it, but it won’t be for lack of trying. It’s a huge relief for all the staff to see this finally happen. Despite all the problems that come with such an old, delicate building, the refurb has gone smoothly so far (touch wood, cross fingers & toes) and we can’t wait to welcome customers back in to see their reactions to the new space! Our new craft beer line-up is coming in, we have a stove on the way and we may or may not have impulse-bought a mystery musical instrument today. It’s going to be amazing. If your refurb is as good as your food I can’t wait to visit again! Cheers Lorna! See you back in soon, we’ll keep you updated on social media on how we’re doing tomorrow. Looking forward to eating in our local, can’t wait. Good luck in the future. Thanks Heather! 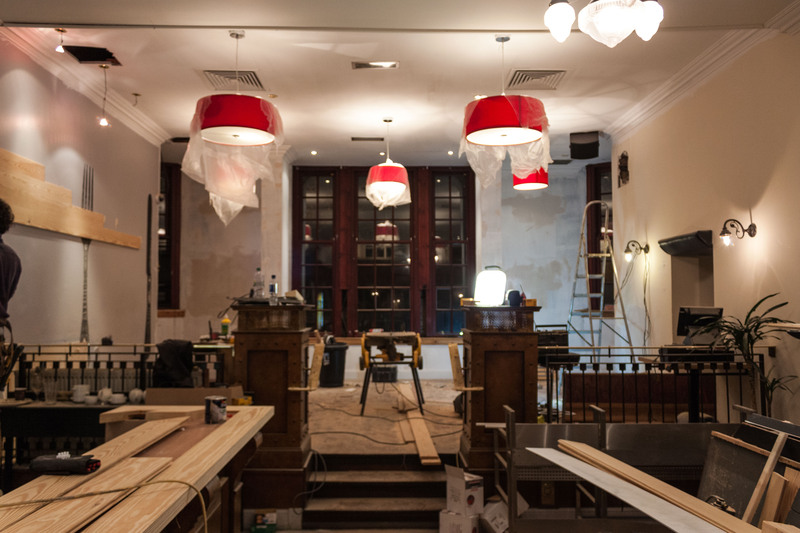 Look forward to seeing you, we’re so excited about the new layout/look. Will keep all the locals updated on our progress today through Facebook and Twitter.